Mirrored furniture is a hot trend right now. Pairing mirrors with a sleek and functional design makes this Butler Transitional Mirrored Nesting Table Set one of our favorite pieces! Nesting tables are a stylish accent for any space, with the added bonus of being able to use them separately when you need to. 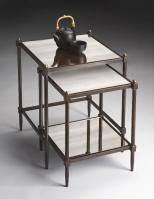 The useful tables feature an all metal construction, and a pewter finish with gold undertones. Both tables have antiqued mirror tops, with an antique mirror lower shelf on the smaller table. For more details visit www.cheapchicdecor.com.